PETER SAMMONS is an evangelical Christian writer and speaker, based in Cambridgeshire. He is married, with one son. This book makes a powerful and compelling case for the authenticity and truth of the accounts in the birth narratives of the New Testament. 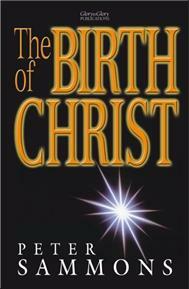 The reader is taken through the biblical and historical background to the nativity of the Lord Jesus Christ. The signiﬁcance of each aspect is explained, including the virgin conception, the visit of the magi, the ﬂight to Egypt and many other topics. Detailed appendices provide useful guidance on many matters, including the fulﬁlment of particular Old Testament messianic prophecies and the complete reliability of the Scriptures. For Christians who wish to challenge widely taught liberal views on the birth narratives, and to be equipped by knowing the evidence for the truth of the biblical view. The book is also presented in a way which will be appealing to enquirers who wish to consider the evidence of Scripture and history. Although this would make ideal pre-Christmas reading, it could also be proﬁtably used for personal and group Bible study at any time. A useful resource for preachers and Bible teachers. Retailers will ﬁnd that the exceptionally well designed cover makes a good, strong, topical seasonal impact and will display well in the pre-Christmas sales period, whilst not being tied exclusively to the season —it is also appropriate for ongoing year-round display.